Taylor Phillips is perched on her chair in the speech therapy suite of the Center for Disabilities and Development at University of Iowa Stead Family Children’s Hospital. Laura Bohnenkamp, a speech language pathologist, is leading Taylor through a raucous reading of the children’s book Mostly Monsterly by Tami Sauer. The two of them bob and growl in turn, mimicking the heroine of the book, Bernadette, in her highest form of mayhem. Taylor relates well to Bernadette because she herself is going to be monster for Halloween–a very colorful rainbow monster. The feisty 4-year-old from rural Jefferson County has the perfect personality to pull it off, laughs Taylor’s mother, Lisa Phillips. Before the Halloween festivities, however, Taylor and her family have a pleasant mission to fulfill. She, her brothers, Brody (age 6) and Blake (3 mos. ), and her parents, Josh and Lisa, will take a trip in October to St. Louis as conference guests of the American Physical Therapy Association Section on Pediatrics (SoPAC) . Entered in the "Send a Family to SoPAC" contest by her physical therapist, Katie Laubscher, Taylor was chosen for the prize. The family has their choice of sightseeing venues and can attend whatever conference sessions and events they choose. Many conference sessions are focused on up-to-date research about therapy interventions, adaptive mobility, and adapted recreation activities for children who, like Taylor, have cerebral palsy or other developmental disabilities. There are fun activities as well, such as an adapted tai chi fitness class to which the family has been invited. Best of all, the AMBUCS Organization will be presenting Taylor with an adaptive tricycle at their Amtryke Rodeo on Saturday, Oct. 24. 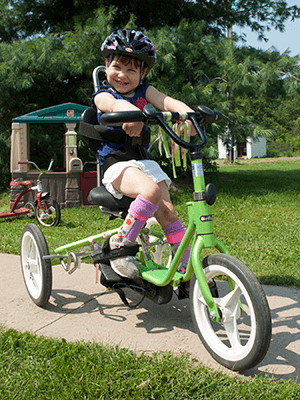 The family was able to assist in selection of the tricycle this summer, so Taylor will have time to enjoy her favorite outdoor activity well before the snow falls. Taylor has spastic quadriplegia with hypertonia, meaning her limbs are stiff. She had surgery earlier this year to relieve some of the tautness in her ankles and hamstring muscle and is beginning to work on sitting skills. In addition to speech therapy and physical therapies, Taylor spends time each week working on dressing skills in occupational therapy with Jan Jasper and Deanna Daugherty. Three hours of back-to-back therapy sessions per week tire Taylor, but she never gives up. A hard worker, Taylor is imbued with amazing resilience and quick intelligence. “Her mind is a million miles ahead of her body,” says Lisa.